The body of former Israeli Prime Minister Shimon Peres will be laid to rest in a funeral attended by world leaders flanked by heavy security. 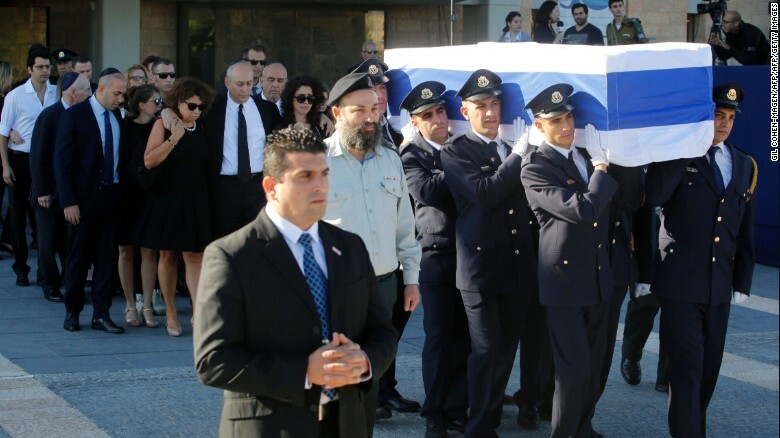 Early Friday morning, Peres' casket was loaded onto a hearse for the drive from the Knesset -- the Israeli parliament of which he was a member for more than 45 years -- to the national cemetery at Jerusalem's Mount Herzl. 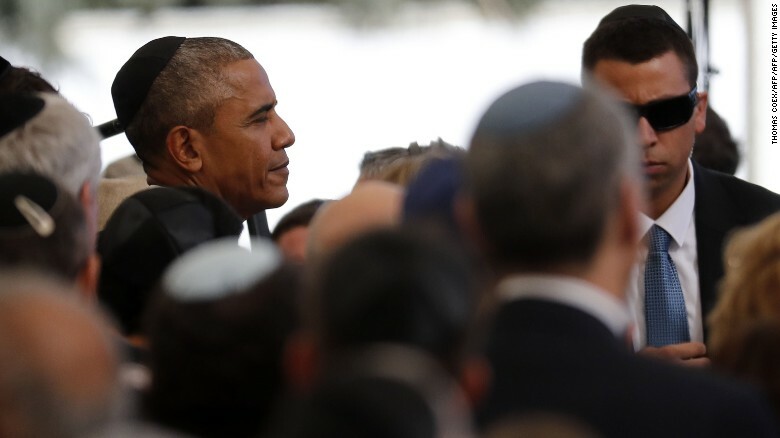 A long list of dignitaries and foreign leaders arrived in Jerusalem to pay their respects, including President Barack Obama, Palestinian Authority President Mahmoud Abbas, Egypt's Foreign Minister Sameh Shoukry and the leaders of France and Germany. President Obama took time to greet guests before the ceremony. A video tweeted by a spokesman for Israeli Prime Minister Benjamin Netanyahu showed him shaking hands with President Abbas. The moment appears to have taken place before the two leaders entered the funeral. Abbas took his seat in the large white tent on Mount Herzl, while Obama sat next to Chemi Peres, one of Shimon Peres' sons. Members of the Knesset guard carry the coffin of former Israeli prime minister Shimon Peres. Around 8,000 police officers have been deployed at key locations to protect world leaders amid fears of a "lone wolf" terrorist attack. Though Israel Police spokesman Mickey Rosenfeld told CNN Thursday that there was "no concrete intelligence whatsoever" about any potential attacks. Amanpour: Will peace be buried with Peres? 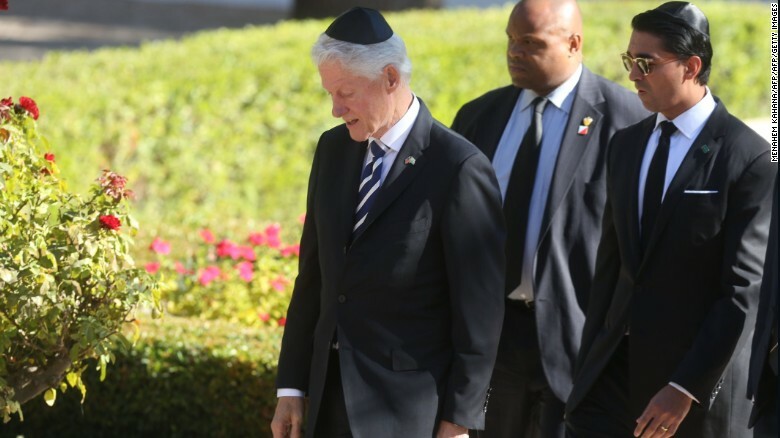 Former US president Bill Clinton was in attendance to pay his respects to Peres. Peres' body was lying in state Thursday at the Knesset ahead of Friday's funeral ceremony. A steady trickle of mourners streamed past police and journalists to pay their last respects, with many stopping to take selfies with the flag-draped coffin in the background. Israelis wait to pass by the coffin of former Israeli President Shimon Peres, September 29, 2016. 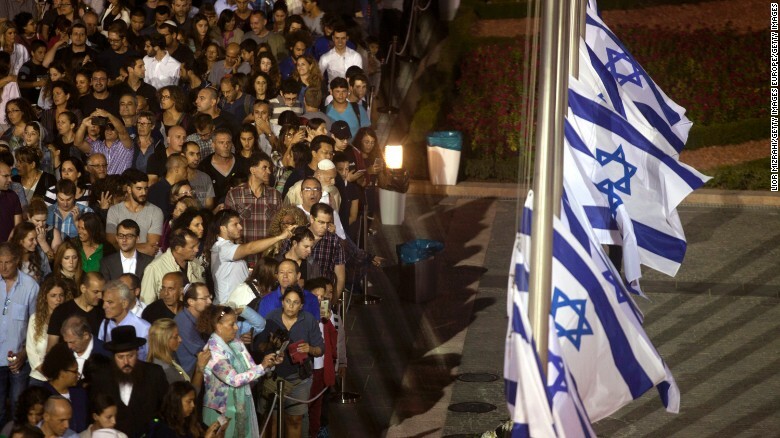 An estimated 25,000 people passed in the first eight hours of public visitations, Knesset spokesman Yotam Yakir said. Some expressed admiration and respect for the man, even though they disagreed with him politically. "My heart wanted to come and take part in this day. We say goodbye to an icon that represents Israel in the world and I wanted to thank him," said a 25-year-old Jerusalemite who identified himself as Jonathan D.
But, he added, "I was against a lot of things and ideas he supported related to the Palestinians and the peace process. Oslo was not a benefit for Israel. 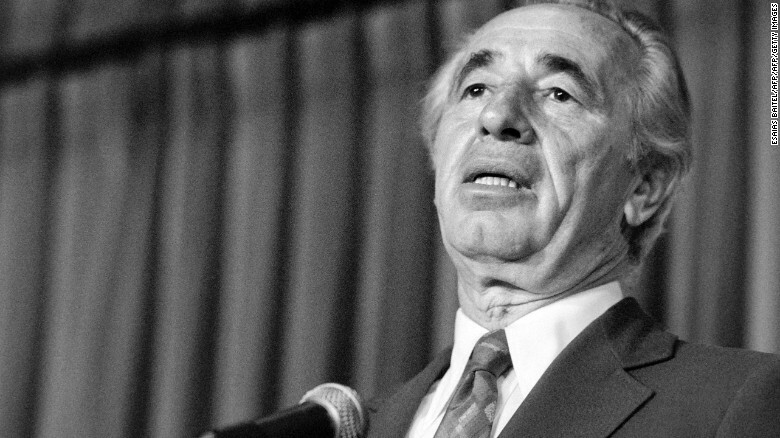 But I am sure that Mr. Peres did those things because he thought it was the best thing for Israel." Reut Ran supported Peres on the peace process, but fears it has no future without him. "Not with the political climate here today becoming more right-wing and more violent," said Ran, who was born in Israel, spent 30 years in the United States and moved back to Israel six years ago. Abbas sent a condolence letter to Peres' family following the news of his death Wednesday at 93. In his letter, Abbas expressed his "sorrow," noting that Peres was a partner in making peace alongside the late Palestinian leader Yasser Arafat and the late Israeli Prime Minister Yitzhak Rabin. Peres, Arafat and Rabin shared the 1994 Nobel Peace Prize for their efforts. Abbas and Peres will forever be linked by the 1993 Oslo Accords, the peace deal they worked to forge and one that would lead to Peres receiving a Nobel Peace Prize. The two leaders still believed in the Accords, even in the face of a stalled peace process and amid growing criticism of Oslo. The Palestinian delegation will also include chief Palestinian negotiator Saeb Erakat, Abbas' office said. Hamas -- the Palestinian Islamist movement that controls Gaza -- blasted Abbas for his letter of condolence, saying it disregarded the suffering of the Palestinian people, Hamas spokesman Sami Abu Zuhri said in a statement. The statement was not a direct response to the announcement that Abbas would attend Peres' funeral. Hamas is a bitter rival of the Fatah movement with which Abbas has long been associated. According to the latest list of dignitaries released Thursday by Israel's Ministry of Foreign Affairs, US Secretary of State John Kerry will be there alongside Obama and Clinton. New Jersey Gov. Chris Christie -- a close adviser to Republican presidential candidate Donald Trump -- is also on the list, which was released before Thursday's train crash in Hoboken, New Jersey. 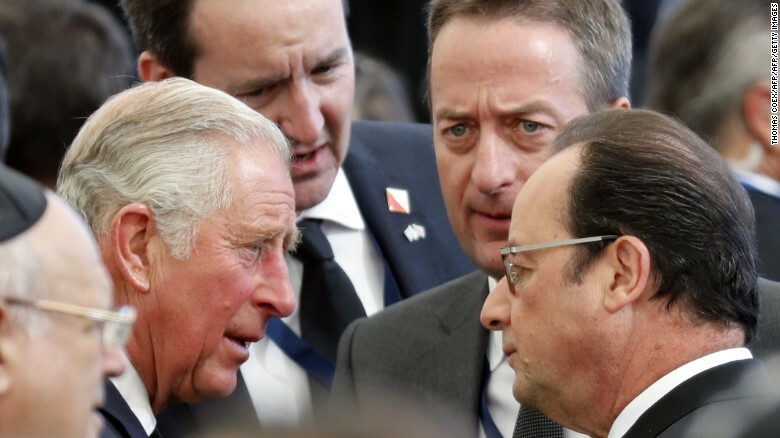 French President Francois Hollande and Britain's Prince Charles, Prince of Wales, were both in attendance. Prince Charles and British Foreign Secretary Boris Johnson are also listed, along with former UK Prime Ministers Tony Blair, Gordon Brown and David Cameron. Also expected are the presidents of France, Germany, Ukraine, the Ivory Coast, Togo, Mexico, Lithuania, Serbia and Romania and NATO's secretary general and the grand duke of Luxembourg, among others. Arab leaders are notably absent from the list, although the King of Morocco is sending a representative. CNN's Oren Liebermann and Amir Tal reported from Jerusalem, while Laura Smith-Spark wrote in London. CNN's Hamdi Alkhshali, Richard Allen Greene and Abeer Salman contributed to this report.